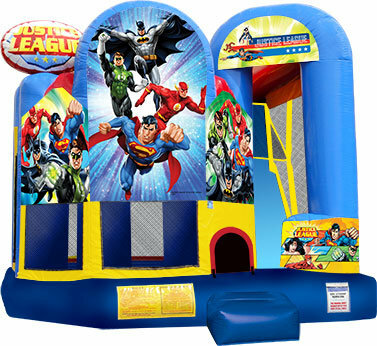 The15 X 18 Justice League encompasses strength, power and courage in this energetic Backyard combo inflatable jumper from Ninja Jump. With four activities from which to choose, kids can practice their superhero skills alongside Batman, Superman, Wonder Woman, Flash and Green Lantern. This impressive Justice League Backyard combo inflatable jumper offers colorful artwork at every turn, and is sure to draw quite a crowd. The 15 X 18 Backyard combo style jumper is the best in inflatable bounce houses! The spacious interior jumping area offers a basketball hoop. This bouncy castle has an exciting climb feature and a convenient exit slide for hours of active fun! Parents and spectators are offered easy viewing with the 360-degree mesh sides of this moonwalk. The Backyard combo bounce house is made of lite n strong™ fire-resistant vinyl making a safe and durable product. This awesome Backyard bounce house is sure to make any indoor or outdoor event a great success!